Family of autistic children may find hope – as well as despair – in the stories of ‘autistic savants,’ because most such children will never display the special skills or abilities that have amazingly emerged in a few. I caught a story on the news recently about a boy with autism who, amazingly, has mastered karate. Not too long ago, that same channel presented a story about an autistic basketball prodigy. Next week – write this down – some program will stun the world with an autistic spelling bee champion. I know this will the clairvoyance of a father who has never witnessed such a stunt performed by his own autistic son a big, handsome 20-year-old with a sort of Vince Vaughn charisma but an inability to converse or safely cross a city street. If Walker could say, “Karate, what’s that?” a Richter-scale joy would rock our house. Walker’s failure to produce a camera-ready moment rankles not only because of others’ spectacular successes but because Walker himself seems, in some eerie ways, so tantalizingly near normality. Sure, he can’t converse, play a game, make a phone call or, most alarmingly, speak up for himself. But contrary to stereotypes about autism, he’s empathetic, has a sense of humor and radiates affection for everybody in his life. Yes, he drives us nuts with incessant demands for pizza, spaghetti, and french fries; he delights in trying to read, trying to play a game, trying to do almost anything, actually. And although he has no “autistic savant” gifts and no particular real-life competencies, either, he does have a specialty: astonishing good cheer. Walker is a great guy, but he’s no TV medical segment star. The news media’s obsession with amazing autism stories is fed by a cottage industry of amazing parent narratives, books stretching farther out on the sea of Amazon.com than anyone would care to gaze. These books tell of remarkable mothers and fathers remarkably saving their disabled kids. The typical scenario is this: After discovering a child’s autism around age 2 – or spotting autism’s approach even earlier – the parents get down to business. Ignoring negative prognoses, they mortgage the home, quit their jobs and heroically focus on their child. And – voila! – all the sacrifices pay off in an amazing breakthrough. These parents swim with dolphins or find a combination of vitamins or turn their house into a tough Skinnerian boot camp. Or maybe they locate a medical guru – an unsung Louis Pasteur – who has the answer, but unbelievably no one credits him. The truth is, such efforts are not unusual. Every parent I know has lived a similar saga – that is, similar at least up to the point of magical success. None of these “cures” has swept the autism world because, quite simply, no cure works for all or is complete. My wife, Ellen, and I have tried many tacks with only slight forward progress. Of course, some of the solutions are worth pursuing. Medications and terrific teachers have helped Walker and continue to help him. A neurologist cured Walker of the nighttime seizures that dogged his childhood. A speech therapist befriended him and helped him communicate. A wonderful school is helping Walker prepare for his dream in life: a job. But the mere fact that extraordinary stuff happens should not blur the reality: Despite the incredible efforts of millions of parents, millions of youths like Walker remain uncured. 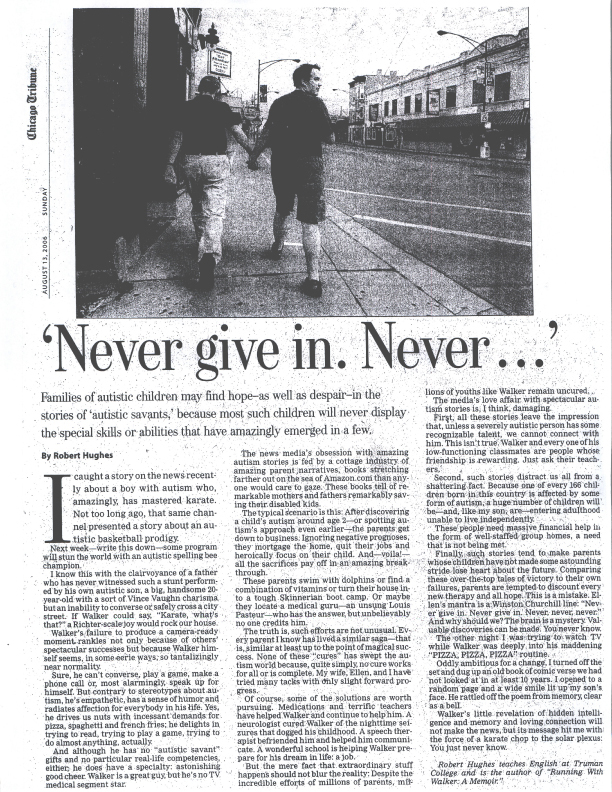 The media’s love affair with spectacular autism stories is, I think, damaging. First, all these stories leave the impression that, unless a severely autistic person has some recognizable talent, we cannot connect with him. This isn’t true. Walker and every one of his low-functioning classmates are people whose friendship is rewarding. Just as their teachers. Second, such stories distract us all from a shattering fact. Because one of every 166 children born in this country is affected by some form of autism, a huge number of children will be – and, like my son, are – entering adulthood unable to live independently. These people need massive financial help in the form of well-staffed group homes, a need that is not being met. Finally, such stories tend to make parents whose children have not made some astounding stride lose heart about the future. Comparing these over-the-top tales of victory to their own failures, parents are tempted to discount every new therapy and all hope. This is a mistake. Ellen’s mantra is a Winston Churchill line: “Never give in. Never give in. Never, never, never.” And why should we? The brain is a mystery. Valuable discoveries can be made. You never know. The other night I was trying to watch TV while Walker was deeply into his maddening “PIZZA, PIZZA, PIZZA” routine. Oddly ambitious for a change, I turned off the set and dug up an old book of comic verse we had not looked at in at least 10 years. I opened to a random page and a wide smile lit up my son’s face. He rattled off the poem from memory, clear as a bell. Walker’s little revelation of hidden intelligence and memory and loving connection will not make the news, but its message hit me with the force of a karate chop to the solar plexus: You just never know.